CINCINNATI -- Seven of Cincinnati’s low-income housing complexes will likely be sold to new owners in the coming weeks, worrying not only the 400-plus families who live there, but hundreds more who are searching for affordable housing in the city. It has been a difficult few years for the 112 families who live at the Alms Hill Apartments – a neglected Walnut Hills building so in need of repair that the city sued the owner in 2015 to improve conditions. As part of that lawsuit, the Alms and seven other Ohio properties owned by New Jersey-based PE Holdings LLC will now be sold. Seven are low-income housing complexes in Cincinnati, including Burton, Entowne Manor and Shelton Gardens. Cincinnati officials have been working closely with a court-appointed receiver to repair the buildings and improve conditions for low-income tenants living in the apartments. But that could change when a new owner takes over, said Virginia Tallent, an attorney with the Legal Aid Society of Greater Cincinnati. “The city has made a commitment to keep these properties affordable. Unfortunately it is legal to sell the property to the highest bidder and the judge could very well determine that is the best and highest use for the properties,” said Tallent, who is representing residents at many of those properties. The Alms, a 200-unit apartment complex in Walnut Hills, will be sold in the coming weeks. A worst-case scenario for Alms residents, who are overwhelmingly African-American and many of whom are elderly or disabled, is that a new owner converts the building into expensive condos because of its valuable Walnut Hills location, Tallent said. That would be an unlikely fate for the other housing complexes because they aren’t located in neighborhoods that are as desirable, she said. But just as bad would be if a new owner maintains the buildings as Section 8 housing but doesn’t make repairs and allows them to deteriorate, Tallent said. That’s why Legal Aid will be watching closely to see which buyers a court-appointed receiver recommends take over the property to Hamilton County Court of Common Pleas Judge Curt Hartman. Hartman makes the final decision on the sale. Legal Aid will intervene in court if necessary, she said, and believes the city may do the same. Hallways at the Alms in 2015 were full of water damage, trash and holes in the ceiling tiles before a court-appointed receiver took over. (Phil Didion for WCPO). Some potential buyers on the short list live locally and have an excellent reputation, she said. But others have no local ties, and are unknown. The long downslide of the Alms began in 2013, when an out-of-state buyer, PE Holdings, bought the building along with several other low-income properties in Cincinnati. “The city warned HUD that the Alms would fall into a state of serious disrepair under the ownership of PE Holdings,” according to a 2017 federal lawsuit. And two years later, in 2015, conditions at five apartment complexes got so bad that the city sued PE Holdings for unfit living conditions and public nuisance. Problems ranged from lack of hot water and heat to broken sewer lines and a roof collapse that forced dozens of residents temporarily from their homes. Entowne Manor on Reading Road in Avondale is a low-income housing complex to be sold in 2018. (Phil Didion for WCPO). Residents were optimistic when a judge ruled the owner in mortgage default and put Jodi Ridings of Milhuas Management in charge of the properties on Feb. 1, 2016. With a receiver in charge collecting rents and paying for repairs, conditions did improve. Passenger elevators were replaced, along with appliances, mailboxes, windows, screens and doors. Repairs were done to electrical systems, the roof and boiler, sewer lines, and apartment interiors. But there were also setbacks, particularly at the Alms. An August 2016 storm flooded the Alms’ boiler system under feet of sewage and water. Then a Jan. 28, 2017 fire at the Alms prompted the need for immediate repairs and an upgrade of the faulty electrical system. Long-term repairs got delayed and U.S. Department of Housing and Urban Development officials grew unhappy with the pace of the receiver’s work when they visited the Alms, according to a federal lawsuit. Entowne Manor resident of eighteen years, Lucias Chriswell, explained the issues with the building and the management in 2015. (Phil Didion for WCPO). After several failed inspections, HUD sent a notice to the Alms’ owner and receiver in July that its Section 8 contract would be terminated after more than 30 years, and residents would be forced to move. But residents did not want to move. In September, Alms residents filed a federal lawsuit against HUD, fearing they could become homeless if the agency ended the low-income rental subsidies to the complex. Mattresses and couches piled up outside of Entowne Manor in Avondale in 2015. But HUD attorneys fought back, saying the Alms is in “deplorable condition with a potentially dangerous roof” and “grossly substandard living conditions,” and listed problems found during inspections, such as exposed electrical wires, roach infestations, cracks and gaps in walls, a serious bedbug problem, and an overall lack of maintenance and cleaning. In October, U.S. District Judge Timothy Black sided with Alms residents and issued a preliminary injunction allowing them to stay in their homes while the lawsuit made its way through the court system. HUD toured 24 units at the Alms, including 5 vacant units, during their inspection on Sept. 7 and 8, 2017, and found 51 health and safety violations. 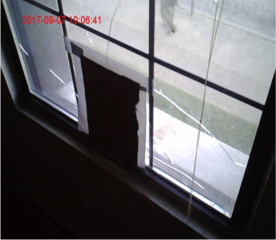 Photo of broken window provided by HUD. “In all scenarios, Plaintiffs will have to move. However, because landlords are not required to accept housing vouchers and there is already a shortage of affordable housing in Cincinnati, there is a realistic possibility some of the Plaintiffs will become homeless,” Black wrote in his order. Then in December, HUD, which had been pushing for the properties' sale, changed course and decided not to end the Alms low-income housing contract. As a result, both sides agreed to dismiss the federal lawsuit. This was a small victory, Tallent said, but the bigger challenge is what happens once the building is sold in the coming weeks. In all, 467 families live at the six low-income complexes in Cincinnati that are up for sale, according to court documents as of Nov. 30, 2017.